Bangalore: Seed in decision making and execution, rootedness in global and national problems, and a greater share for science in the popular imagination are indispensable for the growth of Indian science and engineering research, experts said at a Mint-Infosys Science Foundation discussion on Wednesday. Some of the best minds in science education and research got together for the roundtable discussion on “Resurrection—How Indian science and research can rise and shine". They were joined by ISF Trustee and Infosys chairman emeritus N.R. Narayana Murthy and the discussion was moderated by Mint and Hindustan Times editor at large Samar Halarnkar. The panellists were: Swami Manohar, managing director, LimberLink Technologies; Kannan Soundararajan, professor of mathematics, Stanford University, who won an ISF prize for 2011; Padmanabhan Balaram, biochemist and the director of the Indian Institute of Science; and K. Vijay Raghavan, director of the National Center for Biological Sciences and winner of an ISF prize in 2009. There is a general pessimistic mood about the state of science in India, so let us see how we can get on the long road to redemption. One data point: Just 1.7% of school-leaving children enter the sciences, compared with 14% in the US and 6% in China. Another that is often cited is how we have slipped down in the rankings of countries as far as research is concerned, to drop below 20. So what is wrong and what can be done about it? Raghavan: Is there a problem? Yes. But there are also opportunities, and it is important to focus on that. Second comes the external component. What are the factors outside the scientific establishments that are queering the pitch? Here, there are definitely issues about infrastructure, bureaucracy, policy and the structures that determine the nature of scientific education and research that need to be addressed. The third, which is sometimes not emphasized enough, is that good science happens when the first two factors come together in an exercise that is rooted in society and the global world, based on global interaction. Science is not just about training and education and things like that, but it goes deeper, like music, art or philosophy. So, I actually have a sense of hope. By way of example, a few years ago, there was some worry about our traditional arts and what is going to happen to them. But they are around and they have blossomed. There is no reason to think that Indians cannot do original science. It is just that we have to ensure that this good work does not happen just randomly here and there, but we actually create a demographic dividend from our large population and do it at scale. Balaram: Resurrection implies that Indian science is dead, but I don’t think the last nail in the coffin has been nailed yet. It is still alive. Some of the talk is overdone. The question is how can we make it better and globally competitive? There’s also talk about students not being interested in science anymore. To change that we have to integrate science education with higher education and science and research at elite institutions. As for governance issues, our government agencies have not been able to keep up with the changing world. They have to become more nimble; they are too ministerial. And we need to move much faster while setting up infrastructure, including new laboratories and facilities. Take the case of the National Science and Engineering Research Board, which was conceived and announced in 2005. It has still not happened seven years down the line. In the 21st century, let us realize that seven years is not a short period of time. We need that sense of urgency. Murthy: For the first time in 800 years, there is some respect in the committee of nations for India. They are expecting something worthwhile to happen out of India. Influential people get excited when they talk about India. But in order to consolidate this and make sure the changes are permanent, speed is of the essence. We have to move fast. And research in science and engineering is of the essence. No country has ensured prosperity for its people with out a focus on science and engineering. We also talk about inclusive growth here. But for these things to happen, we have to take quick decisions. The window of opportunity will be closed if we don’t act with alacrity. If there is a sense of hopelessness today, that does not come from our institutions and people, but from our inability to take quick decisions, and our inability to execute. Soundararajan: From the perspective of mathematics, I think we need to do a lot more in terms of undergraduate courses in mathematics. Indian Mathematical Olympiad tests and training camps typically happen after the IIT-JEE (Indian Institute of Technology-joint entrance exams), and when the time comes for olympiad training, students are fatigued by the IIT entrance exam. There are not too many specialized mathematics courses at the undergraduate level. There is IIT-Kanpur and there is the Chennai Mathematical Institute. But we still need more of these and more involvement from elite institutions to train undergraduates. Manohar: It is not just science education, our education system as a whole is in crisis. 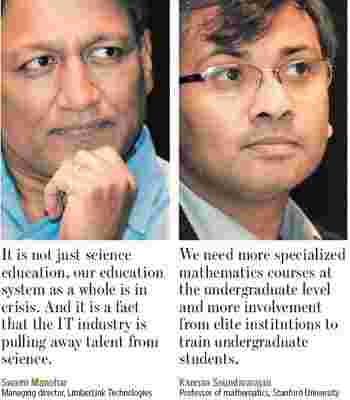 And it is a fact that the IT industry is pulling away talent from science. On the one hand, it is wonderful what the IT industry has achieved in terms of giving our youngsters the ambition to aspire for a better quality of life, and the means with which to achieve it. But what has happened downstream, with students, teachers and colleges, is that everyone is oriented towards cracking that IT industry recruitment tests, getting the necessary marks and skills to get in, rather than on creating knowledge in different subjects. And then, we need to create heroes in science. For example, we need short movies of the new Infosys Science Foundation prize winners on YouTube. And I’ll give you the title: “Why this Gnanaveri Di!" Taking off from that question of heroes in science, what can we do to capture the popular imagination as far as science is concerned? Balaram: We need to create a culture of science writing and science communication in both the specialized and mass media. We need to train more science writers. Raghavan: In the West, there is also a culture of scientists writing about science, and taking on the responsibility of communicating what they do. We are doing something like that at NCBS, and I am optimistic that this will start to happen more and more. We should do well. Kannan: Graphic novels (comic books) are a great way to do that! We should promote more such attempts. Manohar: One important way in which we can do that is to get scientists and experts to weigh in on important national issues. Murthy: The quality of our scientific research has to improve, and one way to do that is to look around and solve interesting problems. That is my message to the research community. And talk to industry. Just out of Bangalore, the IT industry exports $23 billion worth of services. Infosys collaborates with top computer scientists from the top universities in the world. I would like to see more collaboration and connect between our institutions and industry as well. Balaram: I think these connections are improving. You see, Indian industry on the scale it is today is itself relatively new. The new generation of faculty is able to make that connect more easily and they are able to understand issues about confidentiality, etc., that come up when working with industry. This question about IT pulling away talent. That is a dimension I want to look at, though this discussion need not be subsumed by that. 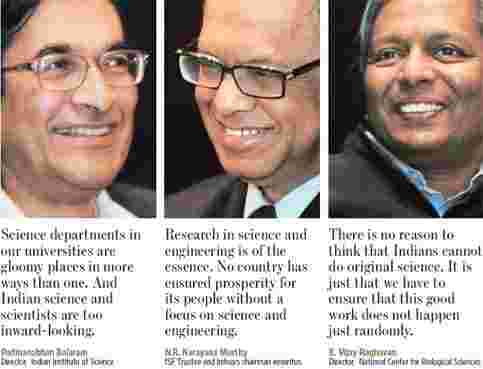 So, in some way, is the Indian dream of a better life crippling Indian science? Murthy: That would not be the right way to look at it. All over the world, there is the pull of high-paying jobs, fame, respect, etc. There is the pull of investment banking, joining a big law firm, and the like. But still, there are always students who want to do science. Here, we do need to create respect for academicians. We have to celebrate academic achievement. How many Padma awardees this year were professors? How may universities call great professors to give convocation addresses? We need to change this mindset. Raghavan: We need to introduce an element of subversiveness into our institutions. We need to provide attractive environments, time to be lazy, time to be creative. Balaram: This IT industry issue is a red-herring. I don’t believe that it is drawing away talent. Indian institutions have created a system which sometimes seems more designed to keep people away. Inside, we wonder why are people so poorly trained? We find people coming to us with poorer and poorer communication skills and ability. The real problem, which is not discussed at all, is the lack of teachers in our schools and colleges. There is the problem of quotas, for example. Good teachers have retired over the last 20 years and they have not been replaced at all. You cannot separate education and research. Kannan: Even in the US, there is always the pull of say a Goldman Sachs. But a rising tide lifts all boats. Question from the audience: Is Indian science too derivative, led by what is happening out West? 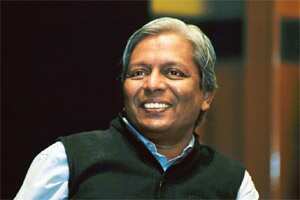 Raghavan: Yes, but change is happening. I am optimistic. Murthy: What is needed is speed of execution and execution focus. I was once talking to the CEO of a Fortune 20 company, and I was telling him about think-tanks in India. He told me, what India needs is action-tanks. Byravee Iyer contributed to this report.